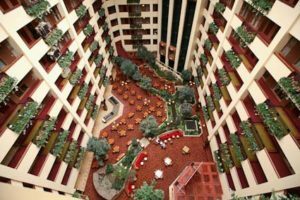 This year's conference headquarters is the Embassy Suites-Downtown Lincoln. The Room Block at this Hotel is SOLD OUT! To make reservations, please call 402-475-4011 and reference "AgrAbility National Training" to access the block and conference rate. The Embassy Suites shuttle is not wheelchair accessible. If you need accessible transportation from the airport to the Embassy Suites, please contact Heather Brethouwer at 402-474-1111 to arrange a pick-up time. Please have your flight information with you when you call. She will also arrange for a shuttle to take you back to the airport. There is transportation available around the city through StarTran Bus Service. All StarTran buses are wheelchair accessible. You can click on the StarTran name to link to their website for more information.